I travel to India a couple of times per year. I purchased an Indian SIM card and I find that there is no network for this Indian service provider in Southern Germany (Friedrichshafen/Konstanz). And as per Indian telecom rules, the service provider deactivates a number that is not in use for more than 90 days. I would like to know if there are any method to preserve my Indian number when I am in Germany and not using the Indian number. For further information, the Indian service provider is Vodafone. And the plan is called a prepaid connection (for people who are familiar with the Indian telecom system). What is the cheapest way to preserve my number? Or what is the cheapest alternative? German telecom companies charge heavily for roaming and I have no interest in using them in India. I have Vodafone India as well. International roaming has to be activated before leaving India by sending a text SMS ACT IR to 144. Top up with Rs. 200 every year before leaving India. I used https://freecharge.in/ or https://www.paytm.com. Or went to the local market in my hometown in India (ich mag). According to the Telecom of India, mobile numbers can't be deactivated if they have Rs. 20 after 90 days of no usage. After that, operators are allowed to deduct Rs. 20 every month. Created an online account at https://myvodafone.vodafone.in. That way, I can monitor the twenty rupee deductions from abroad, and top-up if necessary using the aforementioned websites. The result? You can use the number indefinitely for just a few Euros every year. I think you are misinterpreting what the Indian government regulation says. It does not require the carrier to deactivate your account after 90 days of inactivity, it only requires the carrier to not deactivate your account until it has been inactive for 90 days. What happens after 90 days is up to the carrier. I use Airtel since it is the sole carrier with coverage where I have to visit, but my understanding is that with Vodafone you can keep the SIM alive by just keeping enough of a balance on the account to cover a Rs20/month charge while you are away. This Vodafone web page (see the note after "Step 3") seems to confirm my understanding. Leaving Rs200 in the account when you leave should cover you for a year. That might not be the absolute cheapest way to keep the SIM alive but it is certainly the easiest and isn't particularly costly. When u recharge your number the system will generate a SMS to inform that U have been recharge successfully. It will cost u about 90 rupees /year. It is not necessary to use your sim in India or anywhere in the world , simply keep your sim with u in your pocket, when u get to India just start to use your Sim . Indian telcos have started deactivating SIM cards that aren't active (news coverage), and they no longer consider account balance for this, so all of the above answers are no longer valid. To keep the SIM active, you have to keep recharging it to extend validity. Every network has cheap plans specifically for this. Airtel has a INR 23(€0.3) plan that extends validity by 28 days. Other networks like Vodafone have similar plans (INR 35 or €0.4). You can recharge from websites like Paytm or Freecharge. A more convenient way is to install the mobile app of your network (Airtel's app is called, well, MyAirtel) and login with your phone number. It shows you remaining validity and even sends a notification when it is about to expire, and you can recharge from the same app. 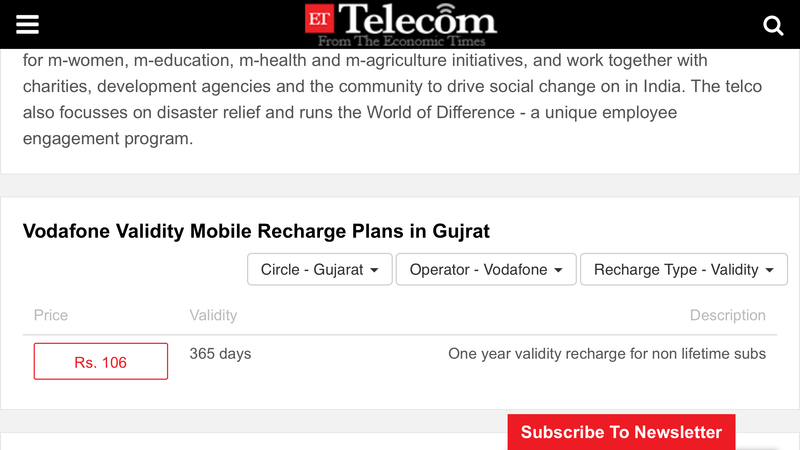 Don’t need to do anything just recharge with Rs 106 N u can get one year validity . So they can’t take any money from ur a/c after 90 days I use my same sim from last 10 years never got any Problem when I get India just top up with 106 . I use my Indian Vodafone SIM here in UAE, It cost me few bucks.. buts that are ok The scenario is: I do Rs.222 recharge in every 3 months (from my SBI internet banking or you can say anyone in India to recharge for you) and I make just 1 call in every 3 months to any friend in India for 1 minute or less than 59 seconds which cost me Rs.140 per call - voila. .. done... don't make any call until next three months.. and no further recharges till then. Received free miscalls from friends and family in India. Receives free sms from your friends and family in India or Banks OTP etc. keep your number active forever. Note: Before completion of 3 months., you will get SMS from Vodafone to " Make a phone call to keep your number active" So., no need to keep a reminder when to recharge next.